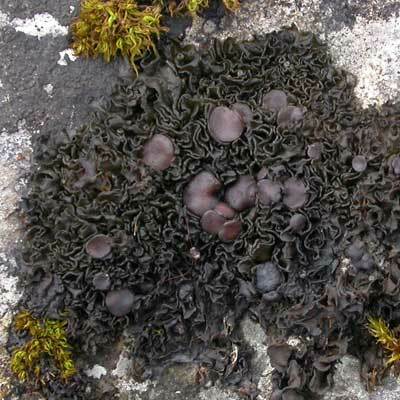 This green-black, rosette-forming ‘jelly lichen’ disintegrates when old, leaving semi-circular ‘moons’ of thallus still attached to the rock; this can be a useful character. When dry it looks like a small, compact, crispy seaweed but is more like a slice through a cauliflower when wet, when the lobes are at their most convoluted. Occasional wart-like isidia are present. Discs are common (to 5mm diam.). 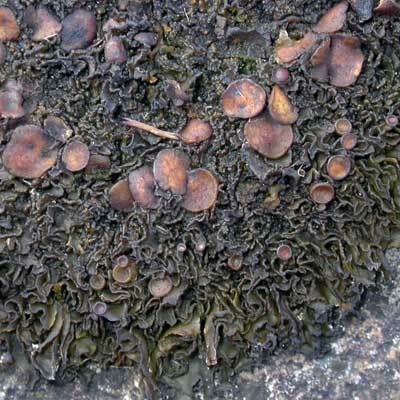 It grows on hard limestones; also on mortar and tombs in old churchyards. It is common in Ireland. Easily disintegrating when dry (centres fall out) to leave arcs of thallus. Simms, M. J., (2016). 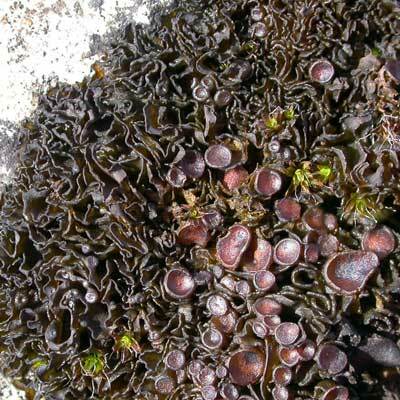 Collema cristatum (L.) F.H.Wigg.. [In] LichenIreland.